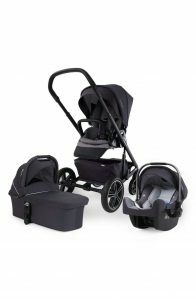 Peg Perego is an Italian company that makes strollers, baby chairs, car seats, children’s toys etc. In addition to their factory in Italy they have offices in Brazil, Canada and the United States. In 1949 Giuseppe Perego made his first baby carriage for his son in Italy. Everyone liked it and wanted one like it and he started his own company making them. We love the beautiful shape and design of this stroller. 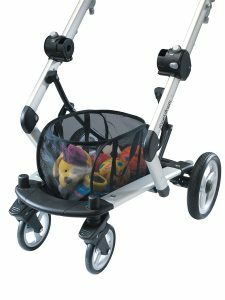 It has lots of features (described below) and unlike most other strollers, it comes with nearly all the accessories you will ever need. The suspension is superb and it pushes really easily. It is very maneuverable and will turn on a dime. 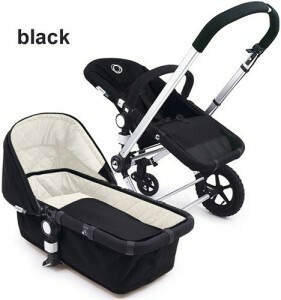 It is a large stroller (even when folded) and it will not fit easily into small trunks. If you have a small car, you will probably have to remove the wheels to make it fit into the trunk. Folding is really easy and only requires one hand. 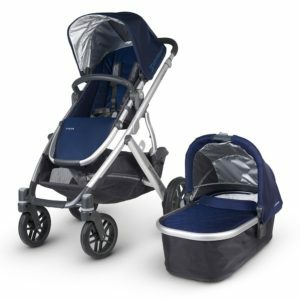 Comes with many accessories – includes large canopy, leg cover boot and rain cover that fits both the bassinet and the stroller seat. The Peg Perego Skate has exceptional maneuverability. This stroller can be easily pushed with one hand and will turn on a dime. The frame is made from plastic and aluminum. Frame durability is a problem. I have spoken to a good friend of mine who sells baby strollers for a living. One of the problems that has occured is the durability of the frame. In some instances it appears to have been poorly constructed and has not been sturdy enough to do what it is supposed to do. Folding and unfolding is incredibly easy on this stroller. It is accomplished by raising the lever located at the base of the handle and simultaneously pressing with your foot where it says “Fold”. Once folded, it is locked secure by using a large latch on the side of the stroller. The seat and the bassinet are one and the same and can be converted from one to the other by the clever use of levers and straps. The seat is comfortable and well padded. It is at a very nice height to work with and is adjustable. However there is a problem with the “Freedom of Movement” harness. 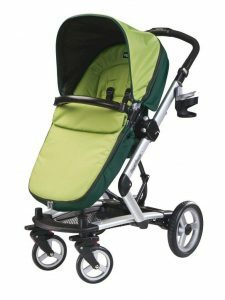 There is a small slot at the rear that attaches to the seat cover but on the stroller I tested, it would not remain fastened. This could be dangerous because if it becomes loose, the baby is no longer secure in the seat. The bassinet is of a new design and is quite large. It can easily be converted into a seat for larger children. Internal dimensions are 30.5″ x 13″. The bassinet is located at a good height which means you are less likely to hurt your back when working with your baby. 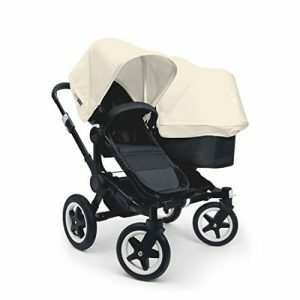 It is well padded, even more than the Bugaboo Cameleon) and it has a 3 position height adjustment. There is a large, adjustable, zippered hood that will also work with the seat. The bassinet comes with a carry handle which makes it very portable. The rain cover (included) will work with both the bassinet and the seat. My baby kept slipping to the bottom of the bassinet as it is a little bouncy. When this happens, it tilts the bassinet even further and makes the problem worse. I could see this being a problem for active babies. The Skate wheels are large and have shock absorbers and ball bearings on all wheels. The front wheels can swivel or be locked into position which is useful when traveling over rougher terrain. The under seat storage area is truly large and also unique. It has a mesh bottom and there is a bungee cord that holds the items securely in place. This is great because you can put all kinds of shapes and sizes in here and not worry about them falling out. If you prefer, you can use the shopping basket which is included with the stroller. This basket is great for smaller items and has carry handles. This basket collapses totally flat so you can leave it in the storage area until you actually need it. 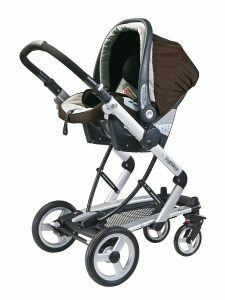 In the Peg Perego Skate reviews, we have found that this is a beautiful stroller and we like it a lot but it does have its drawbacks. It is a large stroller (even when folded) and this will be a problem for anyone with a small car trunk. If you have a SUV then this is not a problem. It is also a relatively heavy stroller so if you have a lot of stairs to use or if you use public transport a lot, you will have to work hard. We really loved the large shopping space and the shopping bag. 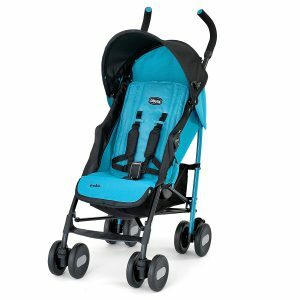 It works well as a Peg Perego travel system if you have a large car. Our two big concerns are with the seat safety harness and the bassinet. We did not feel that our baby was secure enough in either and so we could never really relax while using it. This may have been a bug with the stroller we used but we think it needs to be looked into. The 4-wheel suspension and large wheels made the ride very comfortable for baby and very smooth. 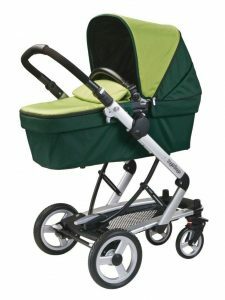 It was very easy to steer and maneuver and this is very important in any stroller. Folding and unfolding was a breeze (which it should be in all strollers) and this is invaluable on rainy or freezing days. 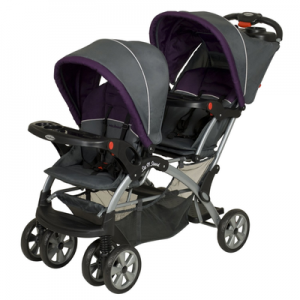 Peg Perego Skate Stroller/Pram System – Geranium Red Design and innovation for infants to toddlers: The perfect and reversible stroller, now a 3 piece system, easily changes from stroller to baby carriage. 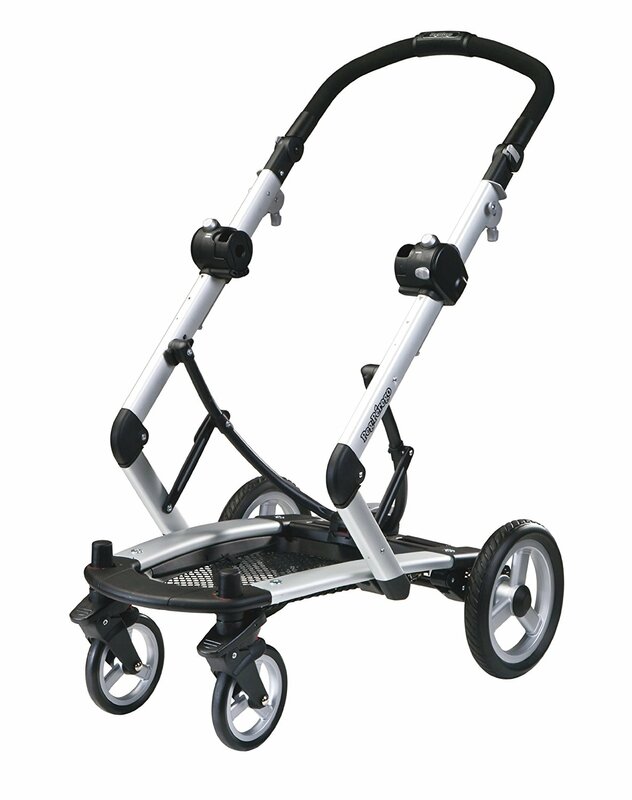 Extremely smooth and easy to push around, now with a lighter weight and a “one hand” folding system.